Everton boss Roberto Martinez has praised the decision to kick off games seven minutes late this weekend in tribute to the Hillsborough victims. At the start of their FA Cup semi-final against Nottingham Forest on 15 April 1989 a crush on the terraces resulted in the death of 96 Liverpool fans. The game ended at 15:06 BST and matches in England's top eight leagues start seven minutes late on 11-14 April. "It's a very important gesture," Martinez said. "[It is a gesture] from the whole league, and everyone in world football, to pay their respects towards what happened 25 years ago. "For us it's an important week, in terms of showing our respect and giving all the support we can to the families and to be all together in this moment." As well as the memorial service at Anfield on Tuesday, neighbours Everton are hosting a service at Goodison Park. Martinez added: "In the city we are going to have an opportunity to have our own service, at Goodison, alongside the service at Anfield. 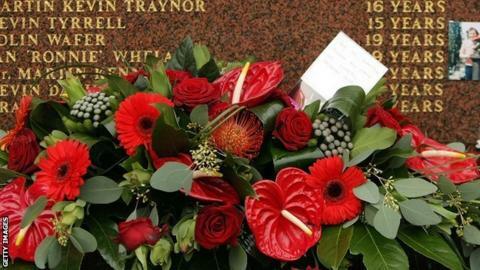 We very much have that in mind, to be able to pay the respects, and every Evertonian will have the opportunity to do that." Fixtures include the FA Cup semi-final on 12 April between Wigan and Arsenal, which will start at 17:07 BST. Hull face Sheffield United at 16:07 BST the next day in the second semi-final. The plan applies to all games in the Premier League, Football League, Conference and its three feeder leagues. There will also be a minute's silence before all matches on those dates, held six minutes after the originally scheduled kick-off time. New inquests are being held for the 96 people who lost their lives in the disaster.